Spectacular Condo With Amazing Front Ocean View From Every Room. The building is perched high on rocks, allowing amazing ocean view from condo. 3 bedrooms , 2 with queen beds, and one with 2 twin beds. 2 full bathrooms. Open , fully equipped kitchen. Watch the ocean while you are cooking. Outdoor pool and a heated indoor pool, gym, 24- hour concierge. One free indoor parking space, ground level and several visitor's parking spaces on top floor of garage structure. Free Wi-Fi throughout the apartment, 2 flat screen smart TVs with Cable TV. We provide linens and towels and beach towels. Public transportation in front of building. 5 min. drive to beaches and restaurants. 15 mins. to mall and downtown. 1 mile to 2 major grocery stores and supermarkets, coffee shops, pharmacies, bakeries. Washer/drier in unit. Balcony with outdoor seating to enjoy your morning coffee or watch the sunset . Very quiet area perfect for relaxation and meditation. 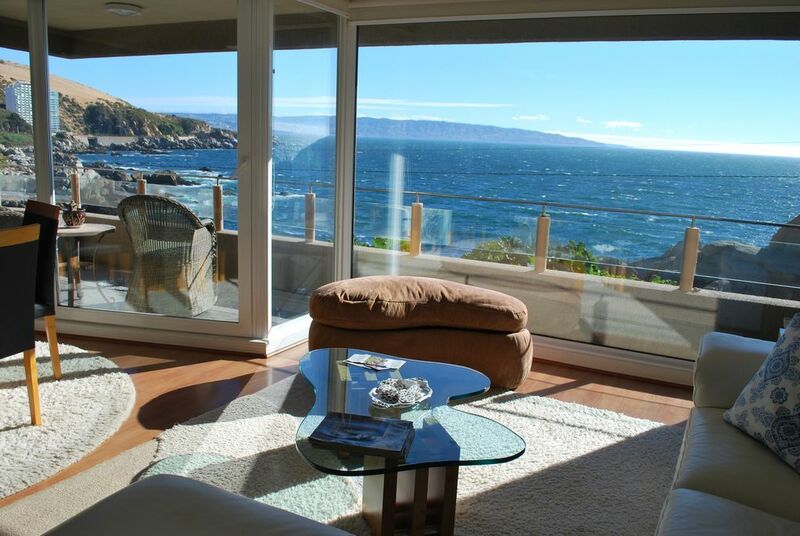 Watch the Pacific Ocean, Valparaiso city lights and amazing sunsets from every room in the condo or from the balcony. Enjoy breakfast in bed watching the pelicans and seagulls fly right in front of your window. Or take a lovely walk along the coast and feel the ocean breeze caress your face. If you are interested in Wine tours I recommend Santa Rita, Concha y Toro Wineries, Maipo Valley. It's an all day tour, you are picked up at your hotel in Santiago and drop off at the end of the day. If you choose to tour the wineries in the Casablanca Valley, I can arrange it so you will be picked up/ drop off at the condo in Con-Con. This tour is usually half a day depending on how many wineries you want to visit. It can be tailored to your preferences. I live in California and Chile with my husband of 42 years, we enjoy traveling the globe, biking, and spending time with our four children, seven grandchildren. We would love to share our beautiful apartment in Chile with you while we're away. Traveling and learning about new cultures has always been a central part of our lives and we encourage others to explore Chile and all the wonderful experiences our country offers year around. Additional parking for visitors on top floor of the building. We provide coffee, sugar, olive oil, salt and some other essentials in the kitchen. Dishes, cooking utensils, pots and pans and glasses enough for 6 people. 2 stools at the kitchen island, making total seating 8 people. An ideal location to explore the coast. Convenient and clean. We would stay again. The views out every window are of the ocean below. The condo is well suited for a family of five or couples. The garage is locked and there is security on the property. We used the pool each day and enjoyed our stay. We felt great about the stay. Thank you John. I hope you visit us again. This Condo was perfect for our family of 4 two adults 1 infant and a 3 year old, pretty babyproof with the exception of a few decorative items which we moved out of reach, the only thing I couldn’t get used to was the hot water, I think there may have been a timer set for when the water was able to get hot there were some days where we did not shower until 11:00am and at that time the showers were not hot at all. The beds were comfortable! There have been other places that we’ve stayed in Chile and the beds were terrible, I think the mattresses were from the US 😁! This is the first place we stayed were i wasn’t complaining of back pain every morning! The views are absolutely spectacular the sunsets are amazing, the ocean breeze was so relaxing! We stayed for 14 days the location was close to the nearest Jumbo and restaurants weren’t far. I am so used to cooking at home but we definitely visited a few of the recommended restaurants in the area he only thing I would of liked better is if the kitchen had a fine set of cooking knives, there were only 3 knives to use for chopping all of which were dull and made cooking extremely difficult. All other kitchen items were sufficient for cooking it was nice there was even some things to cook like pasta, rice etc. And bottled water to drink. The gym was disappointing in the photos it looks like a well equipped exercise room with good equipment, BUt the equipment was very old and very used, I was afraid to get on the treadmill as the belt looked so worn that it may snap off while in use, I’m an avid sporty athletic 30 year old mom of 2 small kids so it’s important for me to stay active, I wasn’t able to complete my work outs in the gym they had but was able to stream yoga 🧘🏻‍♀️ and strength classes on my smart phone and use the space available that they had which was peaceful! I also like to keep tidy while on vacation especially with 2 kids and being there 14 days I cleaned regularly, there wasn’t enough cleaning supplies to clean everything like toilets and bathrooms. We will most likely be booking this condo again this coming year for business trips but I will bring a set of knives next time! Thank you Marjory for your review. your arrival. Sorry about that. As for the hot water, the administration assured me that there is no timer, something that I have been able to verify. We moved back into the condo the next day you left and we had been having plenty of hot water every time. It does need more time to get hot than in the USA but if you let it run it works. You are right about the gym equipment it needs updating. Hopefully it will happen soon. We’ll love to have you again. This condo is very well located, has a well stocked kitchen, is immaculately clean, and has a balcony with a superlative view. There is nice covered parking and the property is gated. There are wonderful restaurants all within easy driving distance, and if you don’t feel like finding a parking place Uber is readily available and very cheap. Just sitting on the balcony while sipping some Chilean wine watching the waves crash on the rocks while the pelicans and gulls fly by is wonderful. We also climbed the sand dunes, walked the beach in Viña Del Mar, saw the murals of Valparaiso, and walked along the rocky coast near the condo. What a lovely place! Incredible view with great comfort! Stayed for two weeks over Christmas/New Year holidays. View from condo balcony was spectacular. Condo was clean and modern furnishings, had everything we needed. Parking garage with easy access and assigned spot as well as second spot on top of garage. 24 hour security guard, nice outdoor pool and indoor heated pool. Workout room on sight. Close to restaurants and grocery store, but need a car for sight-seeing, shopping. Bus stop right across street on coastal road if wanting to just sit back and relax while heading into town. Perfectly located between ConCon and Vina del Mar. We had no idea what to expect (travelling from Australia with no knowledge of the Chilean coast) but we absolutely loved our time here at ConCon. The property indeed had a spectacular view - even better than the photos (which is rare!). Sea-lions just around the corner, pelicans flying past all day, the incredible sand dunes a short 5 minutes away, Valparaiso not too far for a unique cultural experience. Sunsets were incredible! The property had everything we needed...great kitchen and lounge, comfortable beds, warm pool. Everything was easy and safe. Highly recommend this to others who want a special place to stay. Thanks Patricia! Nice location with great views. Reñaca beach is within half hour walk or 5 mins.drive. Cochoa beach is 20 min. walk. Tours4Tips, a 3-hour Valparaiso Highlights walk. A tour to the Casablanca Valley wineries is also a good idea. The Casablanca Valley is an hour drive from Viña Del Mar or an hour drive from Santiago. Some of the vineyards are Indomita, offers nice view of The Valley. No pets allowed. Smoking only on balcony.